Today's Cassini photo is a mosaic of Saturn eclipsing the Sun. The known Rings are visible, along with some that were just discovered. When you closely observe raindrops, they form spheres in freefall. Large objects under the influence of gravity form spheres, and the Universe is very large. Both Phil Plait and Steinn Sigurdsson were at the High Energy Astrophysics Division Meeting. Having been to both COSMO and HEAD, I can add a few observations. Though COSMO should have been a welcome venue for "dark energy" research, the SNAP team sent just one researcher to do a presentation. The poor woman was asking around for a ride because she had no way of getting from Lake Tahoe back to Berkeley. Is SNAP running out of petty cash? 1) CON-X is the next priority after the James Webb Space Telescope. 3) With the ATLAS V booster, Con-X can be fitted into a single launch. The Supernova Acceleration Probe (SNAP) is one of three approved concepts for a Joint Dark Energy Mission (JDEM). JDEM must compete with CON-X and LISA to be next to launch. The crowd from Goddard Space Flight Center was solidly behind Con-X. Even Roger Blandford avoided mentioning "dark energy." Mahndisa has noted that these funding issues have been covered up. Within the next year we must decide which mission is next. This decision was forced on us by the SNAP team. What would happen if people find out that acceleration and "dark energy" don't exist? Now you see why supernova researchers have tried to squelch GM=tc^3. 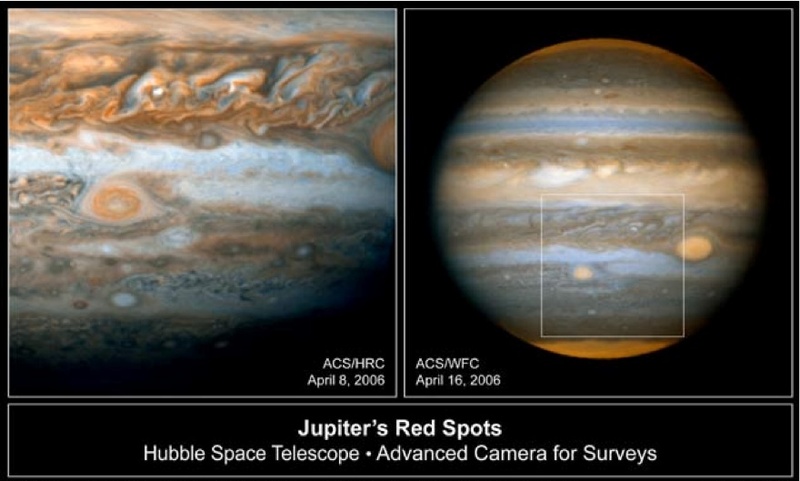 The photos below were taken by the Hubble Advanced Camera for Surveys. 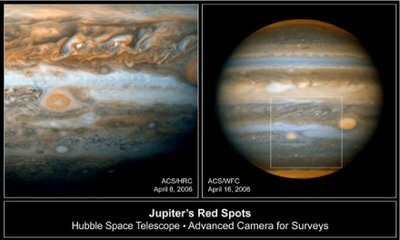 Jupiter's Great Red Spot has been joined by a Little Spot. In April the Little Spot grew large enough to turn red. This is caused by dredging up of darker materiel from deep within Jupiter. Like a tornado's funnel cloud, these features reach deep into the atmosphere. This indicates that Jupiter's interior is warmed by a hidden heat source. For string theorists eating each other, look elsewhere. This site will strive to have the real science. The name "dark energy" was a very poor public relations job. Perhaps the potty religion hypers are losing their touch? Michael Turner grabbed the credit for that term. Hee hee, sounds like "Dark Side of the Force." Those boys have been telling the world for 8 years that a "dark energy" exists while suppressing other ideas. It will be very exciting to see how this turns out. Have you seen Nobel Laureate Philip Anderson's statement about "dark energy" to Professor Sean Carroll in comment number 18 at http://cosmicvariance.com/2006/01/03/danger-phil-anderson? "... the flat universe is just not decelerating, it isn’t really accelerating ... there’s a bit of the “phlogiston fallacy” here, one thinks if one can name Dark Energy or the Inflaton one knows something about it. And yes, inflation predicts flatness, and I even conditionally accept inflation, but how does the crucial piece Dark Energy follow from inflation?–don’t kid me, you have no idea." Is it not generally accepted that the universe is spherical? It just seems so obvious.